The goal of the competitive pyramid framework is to supercharge an already-competitive user experience by tracking player skill levels and presenting challenge opportunities for players to level-up and win. In essence, you’re offering a game within a game, giving players new ways to compete. 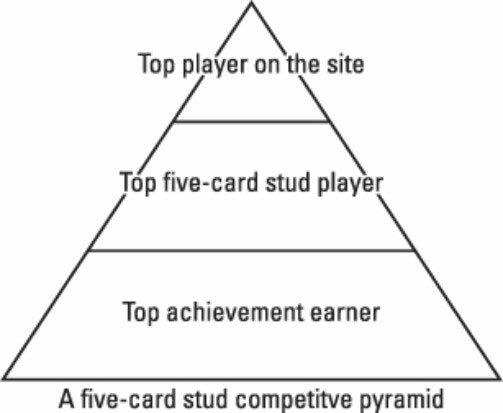 The competitive pyramid framework also works well for gamified sites that involve prediction — think stock prediction, sports prediction (such as Fantasy Football), gambling, and the like. So, what’s with the pyramid analogy? Think of it like this: At the pinnacle of the pyramid is whoever has the most points on the gamified site. One level down is the player with the most points in a particular category. The base of the pyramid is where players demonstrate mastery of individual skills. For example, consider a poker site. At the top of the pyramid will be the player with the most points overall. The middle level might be the top player in Five-Card Stud (as opposed to, say, the top Texas Hold ‘Em player). And the bottom level would display the specific gameplay accomplishments, like winning a certain number of hands with bluffs or going all-in and winning. In that example, players might earn achievements by, say, hitting a flush in spades or four kings. Even if someone isn’t terribly good at Five-Card Stud, he might still do well on the achievement front — thereby increasing his engagement in the game. 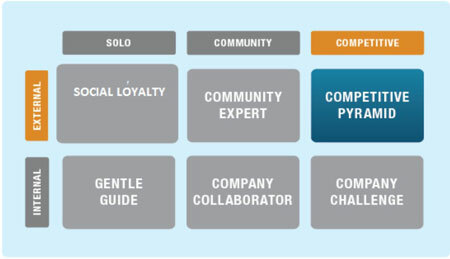 The competitive pyramid framework is effective only in competitive gamified environments. Most typical sites are not a good fit. Competition: Users in a gamified environment naturally enjoy winning. Given more opportunities to compete, players meet the challenge in a variety of competitions. Specialization: Specific expertise enables a user to focus his efforts on winning against a broad base of competition. Winning creates a desire for more victory and leads players to grow into other specializations, in a cycle of winning and engagement. Challenges: Adding game layers to a gamified experience, with chances to level up, motivates players. Multiple game layers maintains user interest and involvement.